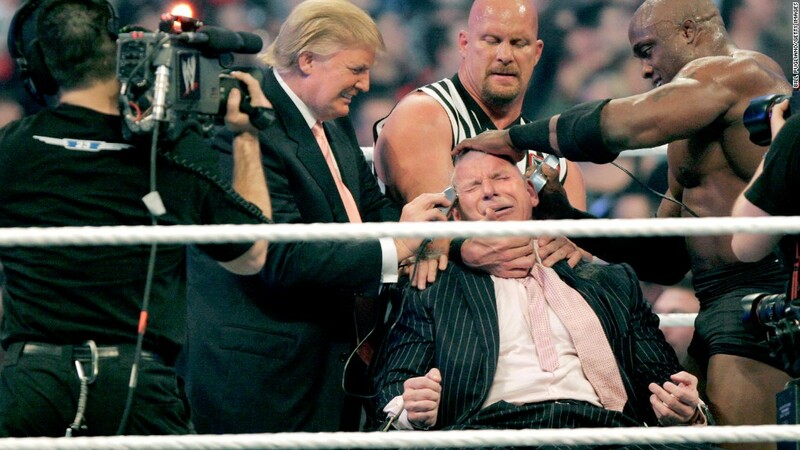 The WWE body slammed naysayers on Thursday. WWE's (WWE) stock surged nearly 15% to a new all-time high on a report that the company may soon sign lucrative new TV deals for its '"Raw" and "SmackDown" shows. NBCUniversal currently airs both shows on its USA Network. NBCUniversal wants to renew "Raw" once the contract to air it expires later this year, but it will not renew "SmackDown," according to a story in "The Hollywood Reporter." Fox (FOXA) is rumored to be interested in bidding for "SmackDown." It might be too expensive for USA to keep both shows. NBCUniversal, owned by cable giant Comcast (CMCSA), may pay three times what it shelled out for "Raw" when it last struck a deal with WWE in 2014, according to THR. The 2014 agreement -- which was for all the WWE programs -- was said to be worth $200 million, an increase of more than $90 million from the prior TV deal. WWE and NBCUniversal had no comment about the deal speculation. Fox, which has already agreed to sell much of its assets to Disney and may be getting a competing bid from Comcast, was not immediately available for comment. It's understandable why NBC may want to pay more for "Raw" and other networks may want "SmackDown": Both shows enjoy huge ratings. The WWE's popularity has led to solid gains in its own revenue and profit. The company makes money from TV licensing fees, its own streaming WWE Network, the live events themselves and consumer products. WWE stock was already red hot this year thanks to solid sales and earnings and big crowds for last month's Wrestlemania and The Greatest Royal Rumble. But the rumors about new TV deals has Wall Street even more excited. WWE co-president George Barrios, speaking at a JPMorgan media conference on Tuesday, said the WWE was open to two different networks airing "Raw" and "SmackDown." In a response to a question about the status of the rights for "Raw" and "SmackDown," Barrios said it would not be an issue to split the shows between two networks, adding that WWE was pretty good at promoting all of its events on various platforms. He said a decision about what's next for both shows should be announced in the coming months. Barrios added that he'd also be happy to do more with Facebook (FB) and other social media networks. WWE recently debuted a program called Mixed Match Challenge that aired on the Facebook Watch video-on-demand service.